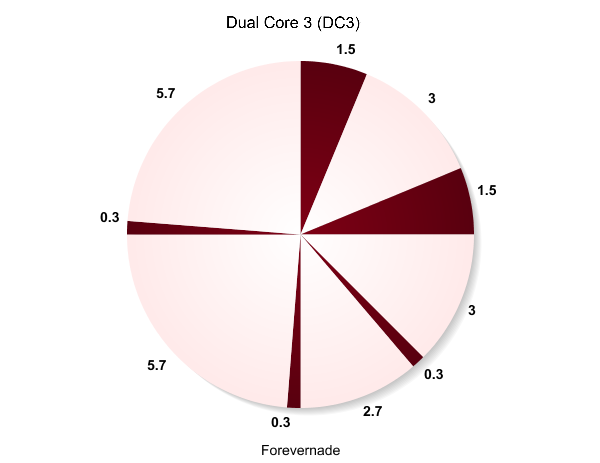 Polyphasic/Dual-Core: A more efficient way of sleeping? Most people will sleep roughly 6-9 hours a day, mostly during the night. However, I don’t want to waste all that time on sleeping, when I could be spending it much more productively. Therefore I have decided to adopt a polyphasic sleeping schedule, based on the Dual Core schedule. This blog is where I will keep track of my adaptation from a ‘normal’ monophasic sleep structure to my new and improved scheme. By distributing my sleep over an entire day, rather than concentrating it all in the evenings, I should be able to survive and function normally on less sleep. As per the graph below, I will from now on take two 90 minute “core naps” at night, as well as two or three 20 minute “catnaps” during the early morning and afternoon. This adds up to approximately 4 hours of sleep per 24-hour period, instead of the traditional 6-9 hours. This leaves me awake for 20 hours a day. Needless to say, this allows much more free time. Although there are more rigorous schemes, such as the Uberman scheme, which would have me work on 2 hours of sleep, but for now, that’s a bit much. Since I live in Ireland, I will register all my times in Irish time. At the moment that is BST (British Summer Time) and during winter it will be GMT (Greenwich Mean Time). Today I started experimenting with my first sleep schedule, after a 24 hour period of sleep deprivation to get ‘into it’. Catnap 2 and 3 are optional; I can skip one if need be (for instance if I can’t get a nap in during lunchtime), but then I have to take the other nap to compensate. The schedule was going to be based of the above graph, with sleeping 1.5 hours, then be awake for 3 hours and then 1.5 hours of sleep again. However, in order to get the maximum amounts of RAM and SWS sleep during my 2 core naps, I decided to move the first nap closer to dusk and my second nap closer to dawn. The time in between I can spend with being productive in some form. I will update this blog regularly with both written and video updates as my experiment continues. This entry was tagged deprivation, everyman, experiment, little, nap, napping, polyphasic, sleep, uberman. Jeyna Grace on Who Am I?